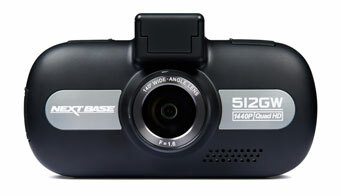 The Nextbase 512GW is part of the companies market-leading range of dash cams. It’s more affordable than the 612GW, with its 4k definition screen, but its list of features is just as long and enticing. The 1440p image quality, unbeatable night vision clarity, and 140 degree viewing angle, makes this a smart choice, even if it’s not the flashiest in the Nextbase range. This model is regularly praised for its superior screen quality, which maintains contrast and clarity in both low and bright light, thanks to the upgraded Sony Exmor R Sensor. This back-illuminated sensor is twice as sensitive as the standard front illuminated sensor, according to Sony. It’s purpose built to capture images in high definition, even when the lighting leaves something to be desired – ideal for driving in any weather. The 3-inch touch screen is easy to control, but doesn’t force you to mess around with too many settings. The 512GW auto-dims when lighting conditions change, and the Intelligent Parking Mode immediately kicks in when movement is detected. The Nextbase 512GW is compatible with SDHC and SDXC Micro SD cards up to 128GB (not included, you’ll need to buy your own), and the magnetic mount is designed for convenient ‘click and go’ fixing. Included in the box is an adhesive mount, quick start guide, 12v car cable, USB cable, and even a window sticker to let other drivers know you’re protected by Nextbase technology. So what’s the 512GW spec like? With a 140-degree wide-angle field of vision, you can capture more of the road. Some find wider angles can compromise picture quality with picture size, but the 512GW captures all the immediate and peripheral detail, including road signs, registration plates, and what’s going on in the outside lane. Send recorded videos straight to your Android or iOS smartphone or tablet to view and share the footage immediately without any annoying wires. The Nextbase app is free to download and makes sharing videos to make a claim or documenting evidence even easier. The lens is comprised of 6 separate layers of glass, coated with an anti-glare polarising filter. Under direct sunlight, this makes a tremendous difference to visibility and reduces reflections. Auto dimming darkens the footage, so whatever the conditions, you’ll have a great view of the road ahead. Replay your footage on the high definition LCD screen. Touch-sensitive buttons are positioned on either side, including a menu button. Users can enter their registration and have it watermarked on each video frame, as well as time, date, speed, and GPS location. For shorter journeys, loop recording is set at 2, 3, and 5 minutes. Over a longer journey, the time-lapse options are between 3 minutes and 2 hours to save space. If you’re parking, the dash cam will switch from standby mode when it detects movement and immediately start recording. Attach the dashboard camera easily to your windscreen with the Click & Go magnetic car mount. Easily fix the camera in place with just one hand before you set off, and you’re ready to go. Accurately position your location with built-in GPS. In an incident, you’ll be able to record location and speed. In case of a crash, sharp motion will trigger the device to record the moment as an emergency and preserve the recording. What’s the Nextbase 512GW like? Dash cams are available with all different price tags, and it’s usually a good indicator of quality and reliability. This is a more expensive model than some, but full of the advanced features you’d hope for. It’s a good idea to get it hard wired professionally to hide cables, keep them out of view, and leave your 12v socket free for other things. You can then unclip it with the magnetic Clip & Go and hide it from view. When it comes to downloading your footage, the in-built Wi-Fi is useful for transferring single videos, but it’s far more convenient to download larger and multiple files using the USB cable and your laptop. The main benefit of the 512GW is its superior screen quality paired with ease of use. The superior image sensor and 6 layers of polarising glass improve visibility in a wide range of conditions. The touchscreen menu is easy to browse and very responsive, allowing users to choose what information is watermarked onto the recorded video, including speed and registration number. Find the best price here! Should I buy a 512GW dash cam? The earlier 412GW model has the same image resolution as the 512GW, but less sophisticated night vision. For some drivers, that’s plenty, but others will prefer to pay for the extras, including time lapse filming. Compared to the 512G, which didn’t have in-built Wi-Fi, this is a massive upgrade. The ability to share videos to your phone and tablet is a massive benefit, particularly for people who record for long periods and travel around. If you value quality, durability, and all the essential features (plus a few more), the 512GW is a smart purchase. Previous articleCan Dashboard Cameras Be Used As Evidence? Next articleDashcam Insurance Discounts – Who offers them?